Hi chickadees! Although it’s the beginning of the week, I’m excited at the prospect of another 4-day work week. I admit it’s not quite as fabulous as the suddenly ubiquitous, and best-selling idea, The 4-Hour Work Week, but I’ll take it. Yes, the 4th of July is upon us and the unofficial midpoint of summer has come (but wasn’t the beginning of summer like last week though?). Anyway, I’m excited to crash someone’s backyard barbeque. Unfortunately, I don’t have access to my own outdoor space so I must depend on the kindness of friends and/or strangers. And if you’re like me without a July 4th shindig to call your own, you probably need to bring something. Most of the time I’m like everyone else, I grab a bottle of some spirited libation on my way over. But if it’s a friend or I have 12 hours notice, I will usually try to make something. The recipes I’ve included today are the kind that don’t require you to be underfoot in someone else’s kitchen jockeying for precious oven or grill space. These are a couple of things that will probably go with whatever your host has on the grill, whether that is hamburgers and hotdogs or Cornish game hens. 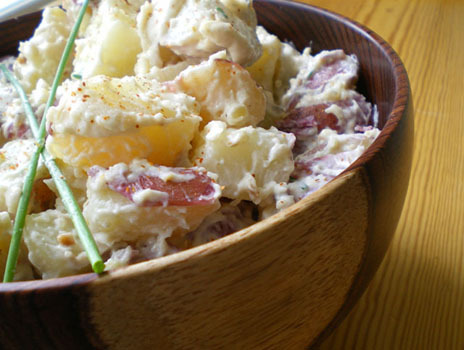 I am a lover of potato salad and I’ve included a new recipe here that is a bit different from most others out there and even if the host already has potato salad, this won’t be the same thing. It has a freshness that most potato salads don’t have because of the addition of the lemon rind and rice wine vinegar. The herbs also add a nice green bite to it. The baked beans are a cookout favorite. This is definitely the decadent version featuring both bacon and ground beef. If you’re uncomfortable with using pork or beef, you can substitute both the beef and bacon for their turkey versions. If you’re uncomfortable with meat in general, google another recipe. The ice box pie is a favorite family recipe. My Uncle Wayne requests someone to make it at every family function then like clockwork hides it in the back of the refrigerator so that no one knows it’s there. If only he knew how simple it is to make. It does include a raw egg yolk in it, but I have never had a problem with it. If you do, just omit it, but I can’t promise it will set up as firmly as it would with the yolk. In honor of the festivities, I’ve included directions for topping the pie with whipped cream, blue berries and raspberries. Everyone will think you worked really hard. Enjoy Independence Day wherever you are! Cut potatoes into 3/4-inch pieces. Bring potatoes to boil in large pot of salted water. Reduce heat to medium-low and simmer until potatoes are tender, about 10 minutes. Drain, let stand until cool, about 20 minutes. Place 1 layer of potatoes in large bowl; sprinkle with some of vinegar and salt and pepper. Continue layering potatoes with vinegar, salt, and pepper. Combine all remaining ingredients in a separate bowl to create the herb dressing; toss. DO AHEAD. Can be made 8 hours ahead. Cover and chill. Taste before serving and adjust your seasonings. Things usually taste less seasoned when served cold or room temperature. Heat vegetable oil in a large skillet over medium heat; sautÃ© onions until soft, add ground beef, cook until beef is browned and vegetables are tender. Add tomato sauce, water, garlic, vinegar, mustard, maple syrup, and brown sugar. Blend well; simmer for 5 minutes. Taste and add salt and pepper as needed. Pour baked beans into the meat mixture. Bake at 325Â° for about an hour. In a mixing bowl beat together condensed milk, egg yolks, and lemon juice. Pour mixture into graham cracker crust. Refrigerate pie overnight or at least 4 hours. Once the pie is set, decrate the top with the raspberries and blueberries. I usually do spokes of alternating red and blue. Melt the apple jelly in the microwave and add the teaspoon of water to thin it out. Let it cool a little then paint the fruit with the jelly mixture to make the pie glisten. Once you get where you’re going, spray a large mound of whipped cream in the center of the pie. If you like Nichelleâ€™s dish, check out all of her recipes here.